(CN) – A Silicon Valley billionaire wants the U.S. Supreme Court to decide his years-long and bitter dispute with the state of California over public beach access near property he owns. 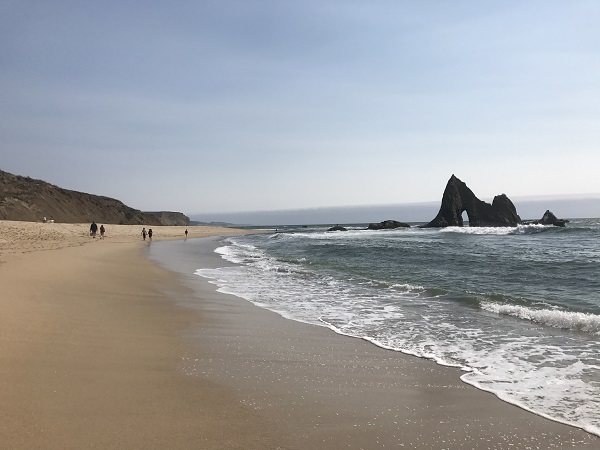 Vinod Khosla, the founder of Sun Microsystems, petitioned the U.S. Supreme Court to reverse a recent unanimous decision by a California appeals court finding Khosla violates state law by barring public access to a popular Northern California beach. California’s high court declined to wade into the controversy this past fall. The case pits private property rights against the California Coastal Act, which mandates public access to all of California’s 840 miles of coastline. Khosla maintains that he owns Martin’s Beach, a property about 7 miles south of Half Moon bay dotted with beachfront cabins, and the quarter-mile road that connects iconic Highway 1 to the beach. He says his ownership of the property gives him the right to decide how the beach and road to it are used. He bought Martin’s Beach in 2008 for about $32 million. Martin’s Beach has long been popular destination for surfers and vacationers. The previous owners allowed people to park at the beach for a fee, or to freely access the beach by parking on the highway and walking. After purchasing the property, Khosla closed the parking lot and put up a gate restricting access to the beach. In 2010, Friends of Martins Beach filed the first suit in state court, saying Khosla violated the Coastal Act. The billionaire eventually prevailed in that suit in 2014, with a judge finding the property was a rancho dating back to the Mexican-American War with rights that predated the incorporation of California as a state, and therefore exempt from the Coastal Act. The Surfrider Foundation subsequently sued under a different legal theory: the group says Khosla needed a coastal development permit from the California Coastal Commission in order to change the gate policy. A San Mateo Superior Court judge ultimately agreed, a decision upheld by the First Appellate District. The Legislature has tried various tactics to secure public access, including a bill to fund the purchase of an easement through Martin’s Beach that was vetoed by Governor Jerry Brown this past October. Brown said the legislation essentially tied the state’s hands by “precluding the use of eminent domain” and dodging a much-needed judicial resolution affirming the public’s right to all state beaches. The Silicon Valley entrepreneur also wanted $30 million for the easement, nearly what he paid for the entire property 10 years ago. The California Coastal Commission and the State Lands Commission have considered pursuing fines and other administrative remedies, but cite the ongoing court proceedings as preventing more immediate action. The nation’s high court could decline to take up the case, which would effectively end the protracted saga. A decision to hear the case could have major implications for public coastal access and coastal protection laws nationwide.